Troubled retailer Marks & Spencer has confirmed it is parting company with chairman Luc Vandevelde. M&S said that Mr Vandevelde was leaving because of "personal commitments" to the family of Paul Louis Halley. Mr Halley, a shareholder in French supermarket Carrefour, was killed in a plane crash in December, and Mr Vandevelde soon joined the board. "A search is underway for a new chairman and Luc will remain... for as long as necessary," M&S said. 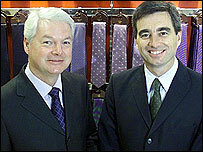 Mr Vandevelde joined M&S in 2000 with the task of reversing sliding sales, but failed to achieve lasting improvement. The departing chairman had been criticised by investors for devoting too little time to the job. In addition to his commitments to Carrefour, Mr Vandevelde runs private equity firm Change Capital and is on the board of mobile phone giant Vodafone. Although food sales have stabilised, M&S's troubled clothing business has continued to decline, despite numerous relaunches. Last month, M&S posted a steep fall in fourth-quarter sales, which sent its shares tumbling to a year low. Retail expert Rhys Williams, of stockbrokers Seymour Pierce, said Mr Vandevelde had brought calm to M&S in 2000 when the iconic retailer appeared to be "spiralling out of control". "But he has spread himself thinly in terms of his commitments and it seemed that he had rather lost interest," he said. On Monday, its share price finished seven pence lower at 270p. 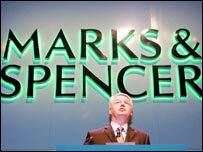 Finding a replacement for Mr Vandevelde will not be easy for the board of Marks & Spencer. There is reported to be a great shortage of senior executives with proven retail track records, and the M&S job could be seen as a poisoned chalice. Weekend press reports said M&S has appointed head hunters to find a replacement for Mr Vandevelde by its annual shareholder meeting on 14 July. The Sunday Times reported that Archie Norman, a former chairman of supermarket Asda and now a Conservative member of parliament, has been targeted. But Mr Norman previously turned down the top job at Sainsbury's, and may simply not be available. Other candidates include David Varney, outgoing chairman of mobile phone firm MMO2 and a favourite choice for M&S independent directors, according to the FT.
Stuart Rose, former boss of fashion retailer Arcadia, could also be in the running, the Sunday Times said. And former Vodafone boss Sir Christopher Gent has also been mentioned as a possible candidate. "Mr Vandevelde has made his exit, but the M&S saga continues"
Is Marks & Spencer's decline terminal? Can M&S bring bling to its brand?